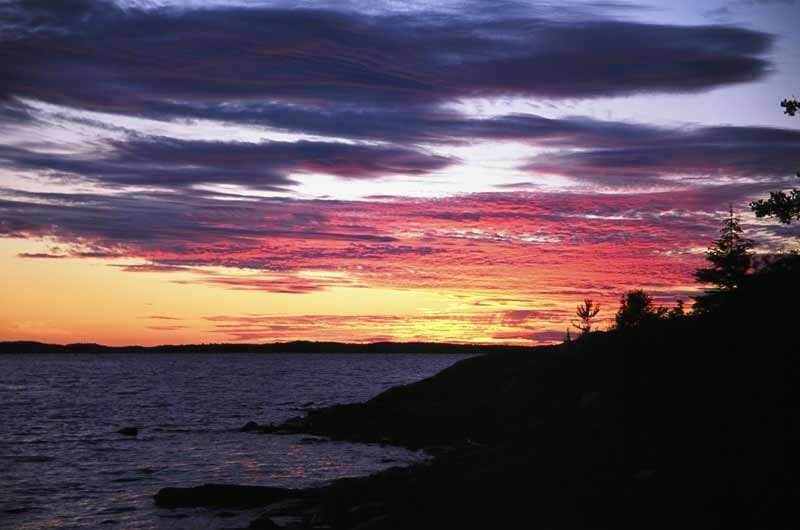 Its picturesque Georgian Bay frontage, its outstanding international summer music festival – the Festival of the Sound – and its native hockey legend – Bobby Orr – are three distinguishing features of Parry Sound. 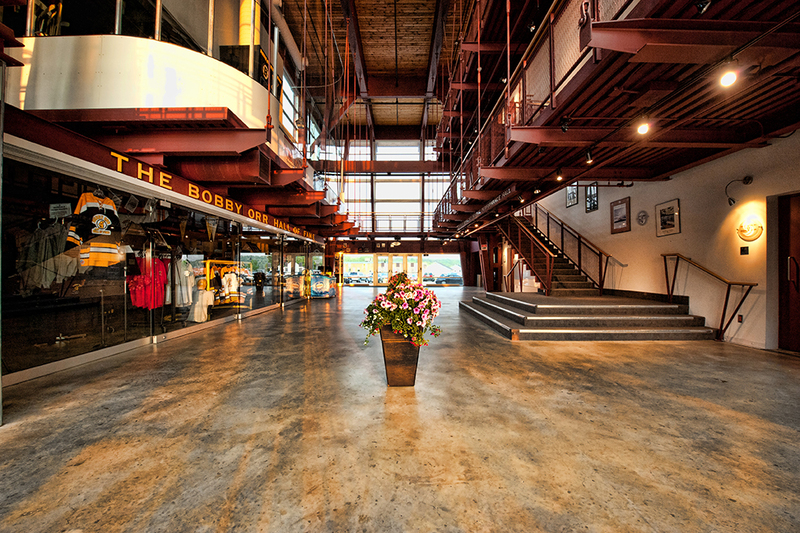 A partnership representing these three features commissioned construction of the Charles W. Stockey Centre for the Performing Arts and the Bobby Orr Hall of Fame in the heart of Parry Sound’s waterfront district. 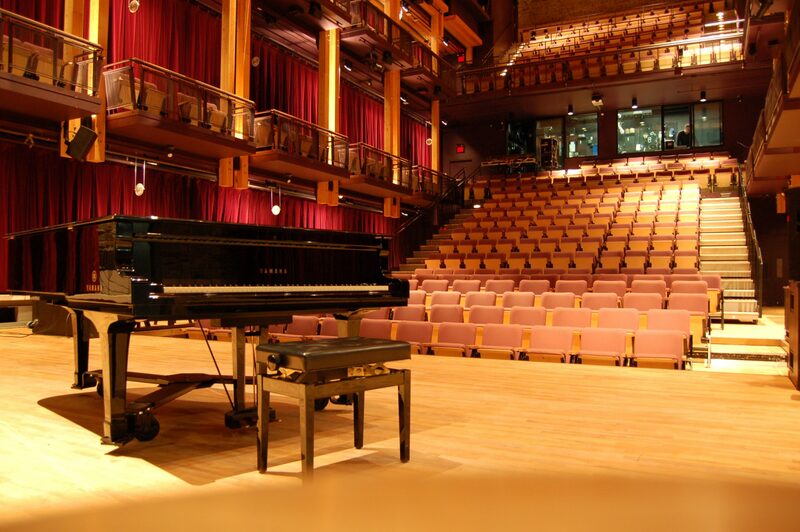 The world-class Charles W. Stockey Centre for the Performing Arts sits on a 1.5 ha (3.5 acres) site. Construction began in the spring of 2002 and the official grand opening took place in July 2003. 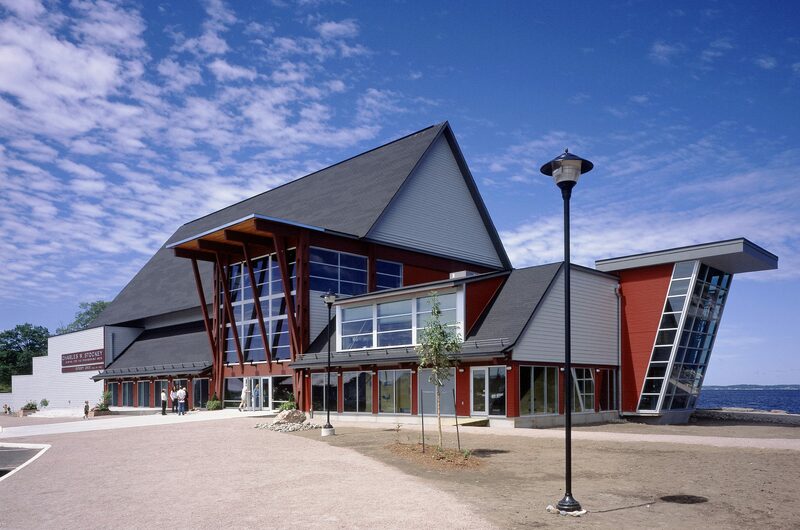 The 12.4 million, 2,500 m square (27,000 ft square) Stockey Centre houses a 480 seat acoustically sound Festival Performance Hall to serve as the new home of the world-renowned chamber music festival, an interactive sports hall of fame, and a hockey museum celebrating many Northern Ontario sports heroes. Part of the Centre is the hockey museum, featuring Bobby Orr, a native of Parry Sound. The Orr’s have handed over a large assortment of memorabilia for display in the new facility. The Bobby Orr Hall of Fame also celebrates the achievements of these athletes using the latest, interactive technologies. A common lobby is shared between the Centre for the Performing Arts and the Bobby Orr Hall of Fame. The complex also incorporates two reception rooms, fully equipped state of the art kitchen, dressing rooms, and a bay-side outdoor performance deck. The main theatre, whose prime function is a diverse collection of year round entertainment and acting as a home to the Festival of the Sound every summer during their spectacular three week season. The Festival Performance Hall can also be configured for raked seating or flat floor for receptions, wedding and conferences allowing the Centre to be used for occasions of virtually any kind. To reflect the unique natural beauty of the area, the building was designed to have the appearance and atmosphere of a Georgian Bay cottage. 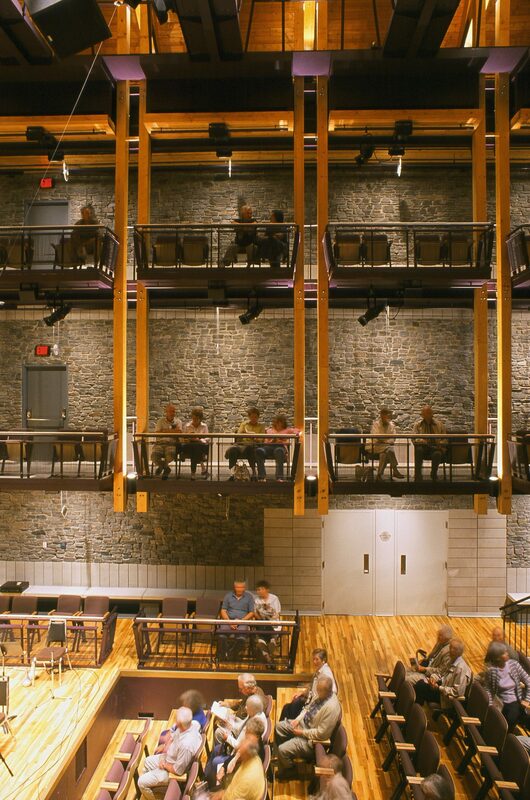 The use of the area’s natural stone and indigenous trees, pine beams and granite from the local quarry add a special intimacy to the interior of the concert hall. The building features heavy timber framing. 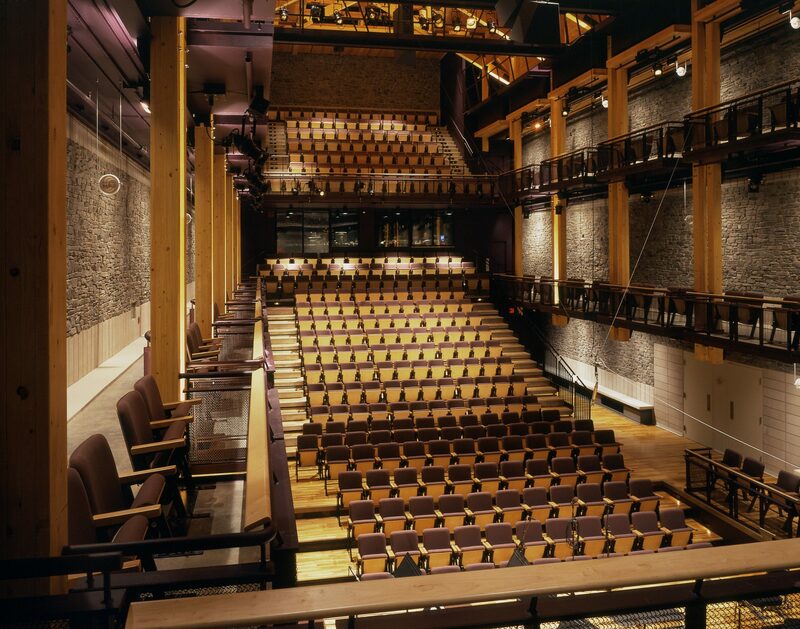 Heavy timber trusses and wood decking are an essential acoustical requirement – they provide both the slightly textured surfaces for good sound reflection, and a visually warm appearance much favoured by musicians and audiences. For the same reason, special acoustical reflectors and suspended ceilings were also made of wood. In addition to the aesthetic and acoustical advantages of using wood in this project, the wood decking was also the most economical choice of material for the auditorium roof in terms of structural functionality. The glulam trusses form the structural skeleton of the 50 degree sloped pitch roof. An 89 mm (3, ½ in) tongue and groove timber deck was the most suitable choice for spanning the 3m (10 ft) between the glulam scissor trusses. The heavy timber decking also acts as a diaphragm, providing additional stiffness to the roof framing system. The exposed trusses spanning between the auditorium side walls provide a 10m (62 ft) high ceiling for the auditorium. The timber trusses not only provide support for the auditorium roof, but also for the two levels of balconies (Figure 14) and the catwalks, which are suspended from two points along the roof trusses using glulam timber hangers. The auditorium floor is made of maple strip flooring supported by a plywood/joist subfloor, on rubber pads, similar to a regular gymnasium floor. 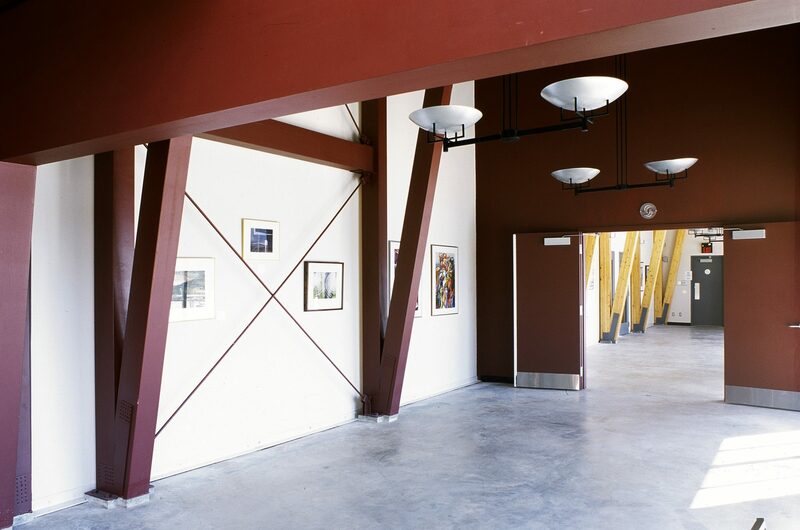 The wood theme carries from the auditorium into the lobby where wood columns and beams create a unique example of combining and integrating architecture and structure. The lobby structure consists of two glulam towers that act as three-dimensional space frames to stabilize the lobby and the front gallery. Each tower consists of four built-up glulam columns linked by four 950 mm (38 in) deep glulam beams supporting the roof, the lobby floors below, and the walkways giving access to the upper levels of the auditorium. The wood framing and decking also extends into the reception rooms, parts of the Hall of Fame and outside the building enclosure to form overhangs and entrance canopies to create a warm inviting presence for the building in its waterside setting. The Stockey Centre is fully equipped with a sprinkler system that encases the complete building, a requirement regardless of construction type for an assembly building of this size. All combustible floor assemblies and the loadbearing walls, columns, and beams supporting them are designed to provide a minimum fire resistance rating of 45 minutes. The wood was sized to conform to the heavy timber construction section of the Ontario Building Code, which meant that it could be left exposed with no additional fire protection. Since the building is fully sprinklered and the sprinkler system is electrically supervised, no minimum fire ratings were required for the roof system. Priority at every stage of the design process was given to the special acoustical needs of the Festival of the Sound and future performances of all types. The acoustics in the Stockey Centre were enhanced by the use of wood decking in the ceilings, soffits, and reflector devises. The wood was treated with a subtly striated finish. In combination with the rough stone walls, the wood diffuses and directs reflected sounds to the audience seating areas. The heavy timber truss members also difuse sound in the upper part of the room before reflecting it down to the audience.